Beautiful sets of cards. I love the added stitched/doodled border on the inner circle! These are adorable! I am so guilty of paper hoarding…I’m so afraid to use because then what if it’s gone forever and I never get it again? Crazy right, because I am buying new paper every week it seems! 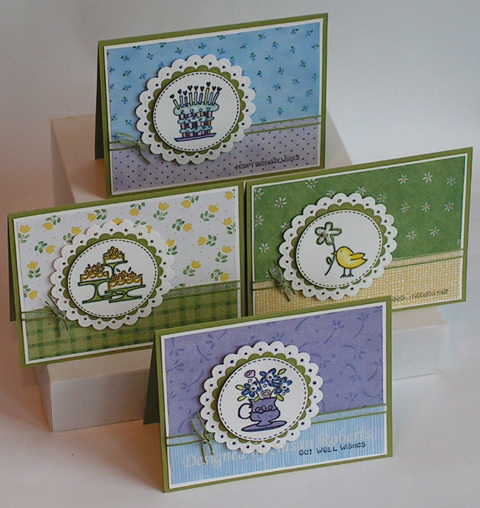 Love what you did with these….great set of cards! These are so neat, Susan! I really love the multi-layered circles. They really draw attention to the main images!! These are all just adorable! Love the scallops! Wow…I love all of these, Susan!!! So very pretty!! These papers are totally adorable and so are your cards!!! I have admired that set, but haven’t purchased it — it is so, so cute and you have played it up to the max — impressive set, my friend!!! Love Love this set of cards – may need to semi-CASE them! Been behind on blog reading – all the cards you’ve posted are really wonderful! I’ve been meaning to re-join the Christmas card challenge again…your cards are a good reminder/motivation!